GoXtra News: 'One Night in Africa' to hit Carnival City! 'One Night in Africa' to hit Carnival City! Breakout Management, DSvt and Carnival City present “One Night in Africa” South Africa’s foremost and most anticipated live African music events and showcase at the Big Top Arena, Carnival City on the 26th October 2013. Featuring mesmerizing performances by South Africa’s most sought after songstress Zonke the blistering party vibes of Mafikizolo and the return of Lesego who will be showcasing material from his latest album. Few people need any introduction to Zonke Dikane who’s performance at Cape Town International Jazz Festival propelled her to national stardom and onto the front pages of virtually every major newspaper and viral forum in the country. Following the justified hype surrounding her live shows Zonke went on to win a number of awards at the SAMA’s further justifying her place as one of the most sort after performers in the country at the moment. AFTER a six-year break, Mafikizolo is back with a bang! Their latest single, Khona, featuring Uhuru, has taken the airwaves by storm. The track is one of the biggest songs at the moment. It reached No 1 on YFM, Umhlobo Wenene FM, Ukhozi FM, True FM, Metro FM & other radio stations nationally and other African countries like Kenya, Zambia, Nigeria and Botswana, Malawi. The obvious title, Reunited, sees Theo and Nhlanhla pair up after seven years following their respective solo careers with them both releasing two sizzling albums. Judging by a few tracks from the album as well as the response from the public, Mafikizolo are looking at a huge comeback with this album, which is set to be one of the best of the year. Catch them live for one of their first performances of their reunion year. After a platinum album, award and acclaim the gospel / soul singer known as Lesego decided to take a back seat to the music industry to come to terms with his success and redefined himself as an artist. His latest album is a tribute to the talent of one of South Africa’s finest exponents of the gospel / soul genres. 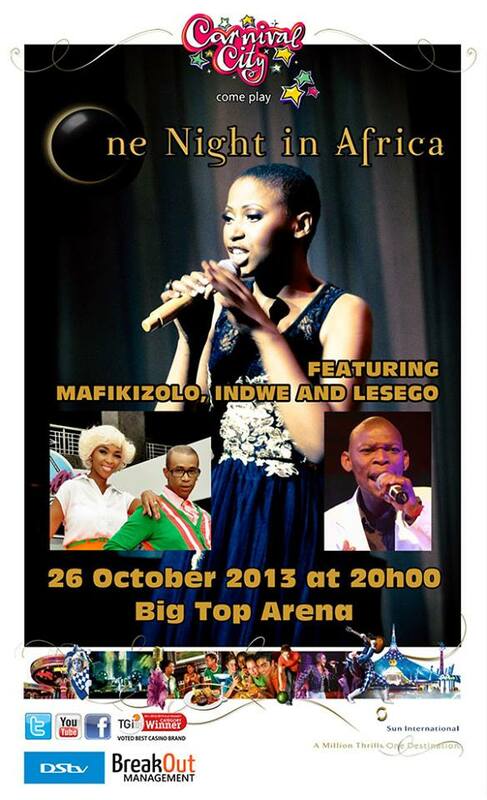 Lesego’s return to the stage is a coup for One Night in Africa.